Legal education reformers have long argued that law school clinics address two related needs: first, clinics teach students to be lawyers; and second, clinics serve low-income clients. In clinics, so the argument goes, law students working under the close supervision of faculty members learn the requisite skills to be good practitioners and professionals. In turn, clinical law students serve clients with civil and criminal justice needs that would otherwise go unmet. Though we have these laudable teaching and service goals—and a vast literature describing the role of clinics in both the teaching and service dimensions—we have scant empirical evidence about whether and how clinics achieve these goals. We know from studies that law students value clinics, but do clinics prepare them to be lawyers? We also know from surveys that clinics provide hundreds of thousands of hours of free legal aid in low-income communities, but how well do clinic students serve clients? These are big questions across a complex field and set of practices that cannot be answered by a single study. Nevertheless, we report here findings from a large data set of cases that shed some light on the teaching-service promise of law school clinics. Analyzing thousands of unemployment insurance cases involving different types of representation, we are able to compare clinical law students’ use of legal procedures and outcomes to those of experienced attorneys in cases in the same court. We find that clinical law students behave very similarly to practicing attorneys in their use of legal procedures. Their clients also experience very similar case outcomes to clients of practicing attorneys. 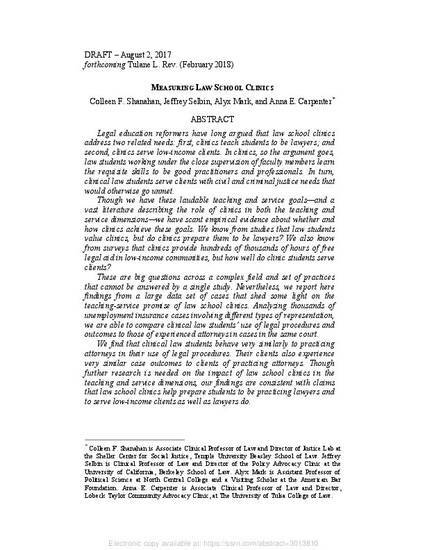 Though further research is needed on the impact of law school clinics in the teaching and service dimensions, our findings are consistent with claims that law school clinics help prepare students to be practicing lawyers and to serve low-income clients as well as lawyers do.